One of the most useful resources I couldn’t work without are my stitch dictionaries, which enable me to create pattern such as my latest Lacy Heart Shawl. 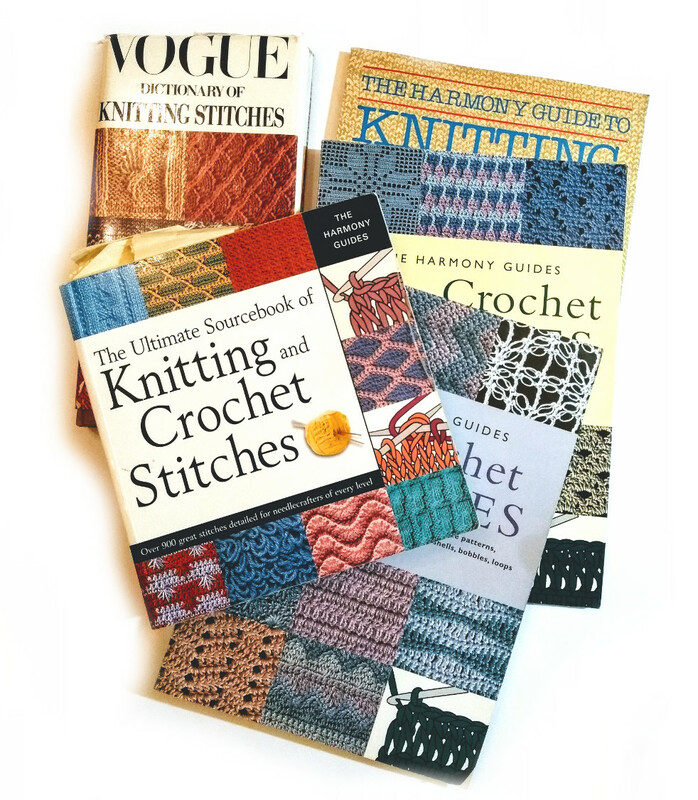 The Harmony Knitting and Crochet guides are absolute classics, dating back over 30 years – but still as relevant and useful now as always. They are easy to follow, with excellent pictures of each stitch. Also included in each is a concise technique section. The Vogue stitch dictionaries also date back to a similar time and are just as useful, again with easy to follow instructions and clear pictures. They include a short technique section and a full pattern for a classic round neck 4ply sweater. One of the most useful sections in this book is the Foreign Language Terms which lists knitting terms translated from French, German, Italian, and Spanish to English! The Ultimate Sourcebook is a newer version of the Harmony series, but is a great combination of both knitting and crochet stitches. It includes a clear and comprehensive step-by-step technique section, and very useful needle and hook size conversion tables so you can work in US, Canadian, or Metric sizes. If you own one a stitch dictionary it gives you the freedom to play around with stitches and easily design your own patterns. Remember a scarf is simply a long rectangle in whatever stitch you like! I would absolutely recommend that you invest in at least one stitch dictionary available in your local bookshops and online stores such as Amazon. If you’d like some advice about it, just ask over on Facebook or via my Etsy shop!